Using the latest in CNC technology and workpiece fixturing we are able to achieve the highest tolerance levels by keeping individual parts on one machine no matter how many processes are needed. This is supported by our state of the art quality control system. 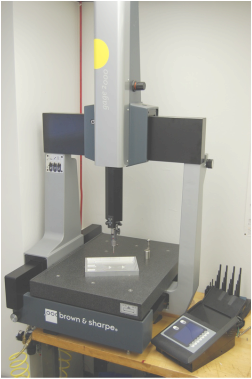 Which starts with our first article inspection procedure and utilizes the latest in CMM technology. We have only the highest quality equipment and all measuring instruments are tracked and managed with a proactive pull for calibration on a scheduled basis. We are ever vigilant to assure that equipment does not go out of calibration. Our Brown & Sharpe CMM is just one example of our commitment to ensuring that we deliver only the highest quality parts. DOCK to STOCK: Our customers approve.